We’re at it again — your pelangueros are cooking up another batch of our one-of-a-kind musical stew. As many of you know, we come with some of the most flavorful rhythms from all corners of Africa, Latin America and the Caribbean. We bring to boil the best Cumbia, Salsa Dura, Soukous, Rumba, Merengue, Coupé Décalé, Reggaeton, Afro Beat and more that promises to have you in a serious sweat on the dancefloor. Here is an antojito mix of some of what we have cooking up for you. 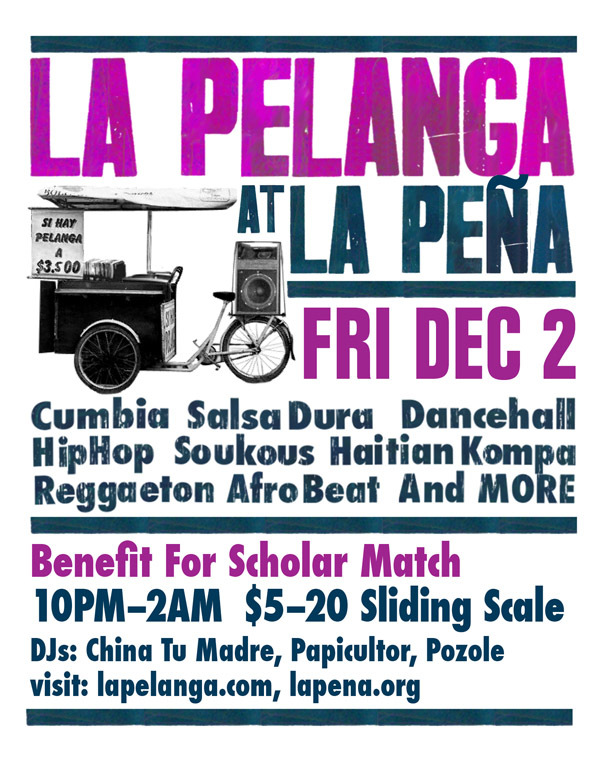 All proceeds go to SCHOLAR MATCH and LA PEÑA. – SCHOLAR MATCH makes college possible for Bay Area students with financial need, by connecting them with private donors. – LA PEÑA CULTURAL CENTER is a not-for-profit, community-based performing arts and activist center. This entry was posted in PELANGA EVENTS and tagged La Peña, Scholar Match by Jacobo (DJ Pozole). Bookmark the permalink. La Peña is at 3105 Shattuck Ave. in Berkeley – just two blocks from Ashby BART.